This game is off the richter scale!!!!!!!!!!!!!!!!!!!!!!!!!! At first glance, Bounty Hunter looks like a really awesome game with excellent graphics. But it is much more complex than that. Bounty Hunter is more of a "mixed bag" with some good things and some bad things. The story is this: You play as Jango Fett, 20 or so years BEFORE the Clone Wars. The whole story sort of revolves around Count Dooku trying to get you to be the `host' for a cloning project on Kamino. While the levels don't relate to this directly, they do involve going after an archenemy of yours named Montross. The story does show the evolution of Jango and Zam's partnership, and even shows how Jango gets the Slave 1! Basically you blast your way through level after level with an assortment of weapons ranging from blaster guns to flamethrowers. One cool addition is the jetpack which allows for increased movement throughout the level. The game has nice menus and starts you off with a nice movie hat leads into the first level. The graphics are nice in the movie but look a little bit plain. The graphics in the game are pretty good though, although this varies from level to level. Sometimes the camera will shake around if you get into a REALLY tight corner. But other than that things look real for the most part. The sound is great if nothing new; it consists of the same old blaster sounds from the Star Wars movies. But the voices are spectacular. Jango's voice has been recorded by actor Temuera Morrison himself, as well as the voice of Zam Wesell by none other than Leeanna Walsman. Although Count Dooku and Darth Sidious's voice leave something to be desired, the rest seem appropriate for their characters. Throughout the game you basically just shoot at whatever shoots at you, and climb over, jetpack over, or jump over any obstacles that get in your way. Occasionally the game requires some thinking, but overall it is fun. And if you get bored completing the levels, you can go off in search of bounties. While sometimes fun, it is often very frustating. To find a bounty, you must scan them with your ID scanner. But this requires you to holster your weapons. So while aiming at a person with your scanner to see if they have a bounty on them, you can get shot. It becomes particularly frustating when your bounty is surrounded by thugs or when it is shooting at you. This is one of the major downsides of the game. The other downside are the levels themselves. With only 3 levels on Coruscant and 3 levels on Tatooine, you wish there were more of them as they are classic Star Wars locations. The levels themselves are big, which is a good thing in the beginning, but really hurts replayability. The game gets VERY hard as you progress, and after spending 45 minutes on one level only to die with the end in sight, you don't even want to try it again. They also aren't designed with multiple passages and ledges, so you can't really explore all over the place. Jango Fett does it again! This game is yet another disapointment in the SW saga! This is the absolute last game I will be buying from Lucas Arts until I try said game out via rental first. Frankly, the quality and design of this game is an embarrassment to it's producers and an insult to SW fans. The game promises bounty hunter action, flying about as the dreaded Jango, ruthlessly collering wanted bounties in a world realized by the graphical power of the gamecube. One of the first thing you'll notice is the poor graphics. Really, when I loaded up this game I thought I was back on the N64. While there are a few good bits, most of the graphics consist of pasty textures with little or no detail (rooms are just a series of rectangles). Anyone who has played Metroid Prime will see an immediate world of difference between these two games. Metroid Prime was created by someone with a love of the game, BH looks like some flunking art students school project. If you think you're going to be crusing the sky via jetpack, stealthily hunting bounties? Think again. The jetpack is but a poor man's booster, operating for about two seconds maximum. It's bascially good for jumping a little higher. Forget stealth, their isn't any. In fact the idiot AI on this game can actually have you standing in a room in plain view of a bounty but as the AI is triggered by distance your enemy can't 'see' you. Combat is equally sophisticated: Mash the A button to fire blaster at groups of identicle enemies, collect health energy, repeat. Enemies are basically all look alikes with a few variations. Here's the worst part. In order to actually collect a bounty you have to identify the target and 'mark them'. Sounds plausible enough right? Well execution is terribly clumbsy - you have to actually holster your guns to scan for bounties. That's right - if five guys are running towards you...you have to stop, put away your guns and scan them...as they are blasting away at you. If you are lucky you'll survive long enough to mark your bounty. Fortunatley the game is rediculously geared toward the easy side...so even this flaw is not a roadblock to progress. Undoubtedly the best game ever! The first time I heard of this game I thought it was a must have. I thought it would be awesome to play as my favorite star wars character. In fact, once I got a Gamecube, it was the first game I got. Here are the pros and cons of Star Wars: Bounty Hunter. 1-You get to play as the most feared Bounty Hunter in the galaxy. 2-You have all the weapons Jango has in the movies. 3-It has a good plot. 1-Levels are way to long and hard. Sometimes you don't even know what the heck you have to do to advance. 2-Graphics could use a little bit more work. 3-It's only one player. This game would be awesome if you could play cooperative. In one of those rare instances where you play someone other than a Jedi in a Star Wars game, Bounty Hunter provided a very interesting and highly entertaining thrill-ride through the underbowels of Star Wars planets. Such levels as Coruscant take you from the roof tops of some of the middle-level buildings, to the lower levels where shady nightclubs and such are. Other levels take you to very interesting and highly lavishly built levels which provide a complex and interesting backstory as to how and why Count Dooku (pretending to be Syfo-Dias) chose Jango Fett to be the clone prototype for the Republic's clone army. The gameplay is solid, and Jango is very powerful, and not invincible. His weapons are easy to figure out, and fun to use, and his jetpack is very useful in almost any situation. You have the ability to lock on to opponents with your guns, though this does not guarantee that all shots will hit, it certainly makes it easier when shooting and attempting to evade a flurry of blaster bolts hurled at you, and you not being a Jedi deflecting them with a lightsaber. Unfortunately for a well crafted game, its biggest and ultimately fatal flaw is that it has absolutely no replayability. It has a relatively short campaign of some 12 missions or so, and that is it. There is no multiplayer, either online or with other controllers, there are no additions to the campaign or non-storyline battles you can do. There is only the campaign, and once that is over, you are essentially done with the entire game. Perhaps waiting a year would make it worth playing again, but otherwise this is not a game you should buy expecting too much. I've beaten the game (yes, I cheated) and It's worth getting to the end. The scenery is great and the weapons... their cool [I still fry up the innocent people with my flamethrower]! 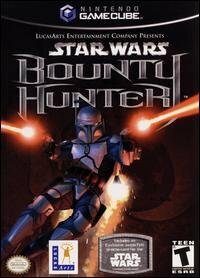 Bounty Hunter is a game that follows Jango Fett, the father of the classic Boba Fett character and also the blueprint for the clone army in the Star Wars prequels. The game chronicles Jango's back story and how Dooku comes to recruit him, and is worth experiencing for Star Wars fans. But it's not always a fun ride. The biggest problem I had was with the weapon selection and switching. Jango comes with all his trademark weapons from the film (flame thrower, rockets, grenades, darts, capture cord, etc), but only his standard twin pistols are effective in a firefight when you've got enemies swarming and shooting at you from all sides. With their average strength and accuracy, and Jango's limited amount of health, you'll be dying often as you make your way through the levels. Switching to other weapons requires going through an unintuitive pause screen (unless you want to be shot while doing so), and the rest of Jango's arsenal would've been much more useful if they could be mapped to the controller buttons and accessed on the fly. The game also has an interesting bounty-hunting aspect where you can nab bounties that in turn unlock extras from the main menu. However, the process of identifying, marking, and capturing a bounty alive is more complicated than it should be, and you'll often be left vulnerable while trying to nab an enemy alive. What Lucasarts does well with, like always, is the overall Star Wars polish. The in-game graphics aren't always amazing, but the cutscenes are nicely produced. Strong sound effects, John Williams music and voice-acting from the likes of Temura Morrison, Leeanna Walsman, Clancy Brown and Corey Burton really sell the Star Wars experience. And there's always the comic book panels, concept art, trading card images, and other extras to unlock. A great game, but come on! I've been working on this game off and on for quite a while. It's a fun game...very challenging in a lot of places. I especially like the feature where you can collect bounties other than the one that's your primary objective...though some of these are stuck in the midst of a large group of enemies, making it nearly impossible to get to them without taking them out (problematic when they're wanted alive). Bounty Hunter has the makings of what could be an award winning game. It has the plot, weapeons, and characters, but what it needs is more free-roaming areas. Like Coursant, its should be a with plenty of space to move around in. If it was more open- spaced areas, you'd be able to find bounties in their own hidout with gangs and so forth. With all the credits you should get upgradable weapons and such. I saw the game trailer for this and it's so awesome!It starts right after The Phantom Menace and ends right before Attack of the Clones!I love STARWARS,and people keep saying that I made a bad choice getting a Gamecube because they think XBOX and PS2 are better,well,this game is defiantly going to be a hit,and there is so much action,also,the graphics are......awesome.You should check out some game trailers from The Legend of Zelda,Starwars:The Clone Wars,STARWARS:Bounty Hunter,STARWARS:Jedi Knight II:Jedi Outcast,because,those will probably beat anything XBOX has to offer.In STARWARS:Bounty Hunter you are Jango Fett,cool,(he was one of my favorite characters in EP.2)and you run around,and fly around 6 HUGE worlds through 18 levels.Your weapons include:Jetbackpack,2 dual pistals,Missile launcher,flamethrower,string-thing,and many more! Undoubtly, The BEST GAME EVER!